To what extent was socialism better in dealing with social, political and economical issues in the USSR than democracy was in the USA? The ideology in the USSR under Stalin was socialism in one country. The ideology in the U.S. was that of democracy/capitalism and rugged individualism. Both ideologies highly contrast each other and can be seen in a positive or negative light. Socialism was a more successful ideology in dealing with social, political and economical issues in the USSR to a large extent than democracy was in the USA but to a small extent democracy in the USA was a more successful ideology in dealing with these issues. ...read more. Under Stalin and socialism there was widespread famine in the USSR and oil was the only resource that had hit its production target in the first five year plan. Politically both the democratic government of the US was stable. It believed in rugged individualism and had a laissez faire attitude towards the economy which led to its prosperity in the 1920's during the economic boom However socialism being an extremist government soon turned to totalitarianism under Stalin and controlled all sectors in society. Politically the USSR was an established strong socialist state. As well it had a lot of influence on other left-wing dictatorships in Africa, Southeast Asia and Latin America. ...read more. Historian RN Rundle (International Affairs 1890-1939) supports this saying that Stalin did strengthen the Soviet Union by his five year plans. Economic rights such as guaranteed employment and free healthcare, which did not exist in the US, was guaranteed for all citizens. As well when the rest of the world was going through the Great Depression in the 1930's the USSR's economy was rising. In conclusion socialism to a large extent was a more successful ideology in the USSR politically since it established a strong socialist state, socially since it abolished all ranks in society and economically because it industrialized the nation. 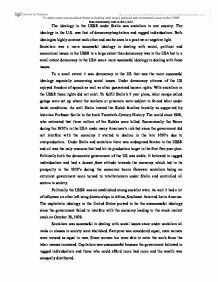 To a small extent democracy in the USA was more successful since there were rights and freedom for the citizens and it economically based on a supply and demand theory. ...read more. In different countries, like France, England and Belgium people started rioting, resulting in different acts, which I will mention later in this essay. After a few passed acts between 1830 and 1847, the hope for political and welfare reforms and human rights created by socialism grew by the 1848 revolutions. However, Britain's handling of the issue of independence had been flawed as they failed to take into account a number of factors. Firstly, minority ethnic groups had little say when it came to the creation of three independent regions within Nigeria (a Hausa-Fulani dominated Northern Region, a Yoruba dominated Western Region and an Igbo dominated Eastern Region). * Both Kim Il Sung, the leader of the DRPK, and Syngman Rhee, anti-communist of the South, were very similar people, though their political beliefs were different. They were both Korean nationalists, who wanted to unite Korea, and saw themselves as the leader of the united Korea. However it has some limitations - for example, Trotsky's writing is heavily biased against Stalin which may have created elaborations and mistruths in order to sway the reader's opinion in his favour. There is also the limitation imposed by a lack of supporting evidence for many of the claims made by Trotsky in the text. Naturally Bismarck regarded this emerging movement as a direct threat to his conservatively inclined monarchy, and thus tacitly exploited two assassination attempts upon Kaiser Wilhelm I to proclaim the socialists as ?enemies of the Reich?. He introduced the Anti-Socialist law, banning socialist meetings, newspapers and public events, resulting in mass arrests and imprisonments.